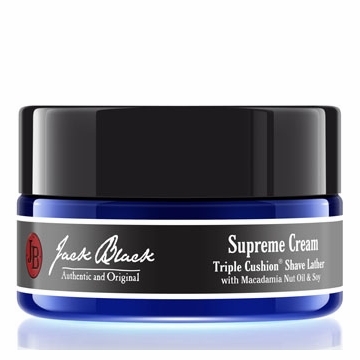 The Supreme Cream Triple Cushion Shave Lather from Jack Black allows for closer shaves, better razor glide, and superior protection against razor burn, nicks, and cuts. The thick cream, which can be applied by the fingertips or a shave brush lifts whiskers from the skin allowing the razor to better cut each whisker. macadamia nut oil and soy oil penetrates tough whiskers and moisturizes facial skin.